The flavor experts in South Carolina’s hot dog cuisine scene treat their craft like an art. Some restaurants have taken one of America’s signature foods and transformed it into their own tasty creation worthy of becoming their dominating menu item. 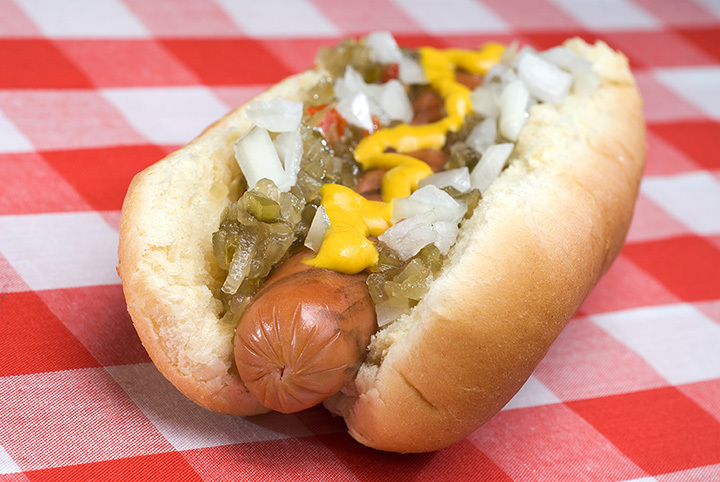 And you’ll agree the moment you take a bite at these top 10 great places to have a hot dog in the state. What started as a small eatery selling anything and everything has now evolved into a hot dog haven for the Upstate. With more than a dozen locations and a 70-plus year tradition of excellence, even a “plain Jane” hot dog from this established chain is tough to beat. There’s a reason the word “famous” is in their name—ask anyone in the Midlands where to grab the best hot dog, and the name Sandy’s is sure to come up. The secret might be in their homemade chili, coleslaw, and pimento cheese that crown their certified Black Angus hot dogs. Or it could be that these hot dogs have a sweet ending—grab a scoop of ice cream before you hit the road. Don’t drive too fast—you might miss this one! Tucked alongside Royall Hardware, Johnny’s Hot Dogs is serving up more than the typical frank and bun. You can stop by the takeout window for breakfast or lunch Monday through Saturday and grab a variety of breakfast sandwiches, lunch wraps, melts, salads, and of course hot dogs. What’s a Joey Dog, you ask? Some folks might call it a chili dog, but those who try it are more likely to call it hot dog heaven. Joey Dogg’s has created some of most blue-ribbon creations yet, like the Reuben Dog, BLT Dog, and the Italian Dog. Make sure you grab a photo with their exclusive Weiner Mobile before you leave! What kind of a hot dog place sells out of its staple offerings with several hours of business still to go? Apparently one of best hot dog places in the state. Here you don’t have to settle for a traditional dog—be adventurous and grab a brat or one of their wild game offerings. With fair prices, savory flavor combinations, and a strong community presence, it’s no wonder you gotta grab them quick before they’re gone! Taco dog, anyone? Baker’s Dogs isn’t afraid to think outside the hot dog bun when it comes to crafting up new variations. They offer an astounding 26-topping variety that ensures you never have to eat a boring hot dog again. Don’t let the classic diner-style atmosphere fool you—these dogs are far from traditional! Top your dog with jalapenos, cheddar cheese sauce, barbecue sauce, pickles, bacon, and a whole heap of other options for a unique tasting experience. Hot Dog Depot is quite popular among the locals, and you know what they say—locals know best. Best hot dogs in Charleston? The people of Charleston think so, which is why they continue to vote Jack’s Cosmic Hot Dogs as the best in the city. Blue Cheese slaw? Jamaican relish? Onion relish? Spicy mustard? It’s an out of this world culinary experience, for sure. Three barstools and a counter has turned into what hot dog fans everywhere now know as Perfectly Franks. Owned by a family of Franks, each menu item pays homage to a different famous Frank—Frank Sinatra, Anne Frank, Frankie J, and others. And quite frankly, you won’t find a more diverse selection of Franks anywhere else.